The Arizona Coyote still have a bunch of prospects who could make the team, but this one stand out. The Arizona Coyotes have been blessed to have a stockpile of NHL prospects and this upcoming season isn't any different. Leading the pack is center Barrett Hayton whom the Coyotes surprised many NHL experts when they selected him as the fifth overall pick in the draft in June. Hayton played with the Sault Ste. Marie Greyhounds of the OHL and performed admirably with 63 games played and tallying 21 goals, 39 assists. At 6'1", 190lbs he's not a bad size for a center and has decent speed. 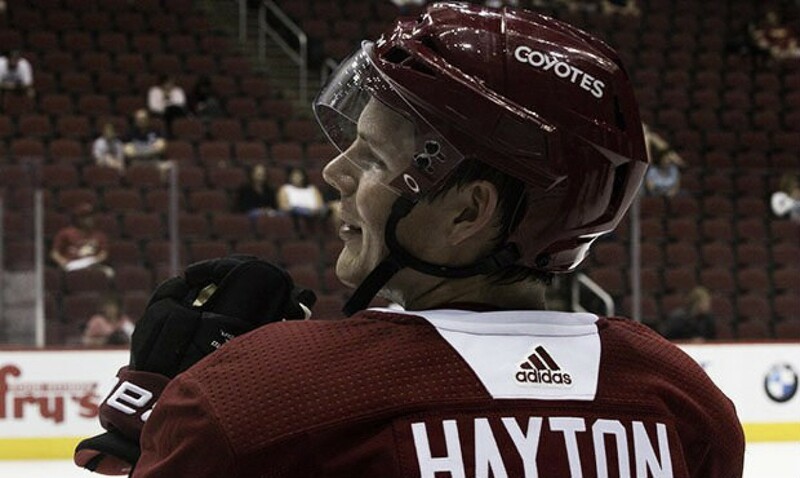 The fact that the Coyotes have an excess of centers on their 2018/19 roster doesn't exclude that Hayton will try to impress his new team with his on-ice skills. He has scored 87 points in 126 OHL games, and will be given a shot to show what he's got at the Coyotes' training camp this month. How can Hayton make the Coyotes a better team? The Coyotes are built on speed and finesse and another center who possesses those skills is always a good thing to have in today's NHL. At the rookie's development camp he showed signs of speed, but more importantly, it's apparent that he is an excellent playmaker. He may not make the final roster this season, but don't count him out next year. Or, if he really burns up the OHL he could be called up during the Coyotes' regular season if injuries pop up... as they always do. What GM John Chayka liked about Hayton (and he HAD to like something to draft him so high) is his intelligent play and two-way discipline not seen in too many younger players. The chances of Hayton making the Coyotes’ final roster may not be great, but if he has a good training camp... who knows? The team is overloaded with centers which tends to allow one to think he won’t be in a Coyotes’ uniform this season. Now if he shows real progress things could change. Some Coyotes’ fans are still scratching their heads on why Hayton was even chosen ahead of a proven scorer in Filip Zadina. Instead there doesn’t seem to be any doubt that Zadina will make the Detroit Red Wings opening night lineup. Barrett Hayton seems to be a talented player who may become a key contributor to the Arizona Coyotes' hunt to improve. Perhaps next season will be his time to shine. Another year in the OHL or the AHL may be what he needs to mature and refine his game. Then again, the Coyotes may soon become impatient with the development... or lack thereof of Dylan Strome. This year could be the turning point to determine his fate with the team. If he fails there’s another young center who could take his place on the roster. His name is Barrett Hayton. What are your thoughts on the fate of Barrett Hayton? Will he jump to the NHL? Let us know in the comment section below, and make sure to give us a follow on Twitter (@VAVELNHL_ENG) for more updates!